I finally got to play with Bev's wonderful new stamp set - Paradise - which includes a beautiful hibiscus, as well as a fabulous toucan. Over at The Male Room - TMR#39 our challenge is to use flowers and make them masculine. I'm very late with my card, but I think this works for both challenges! The layout is based on this week's sketch at Freshly Made Sketches - FMS#245. I masked off a section at the top of the card and stamped the hibiscus flower over the bottom section in grey. I drew in three lines to define the area. 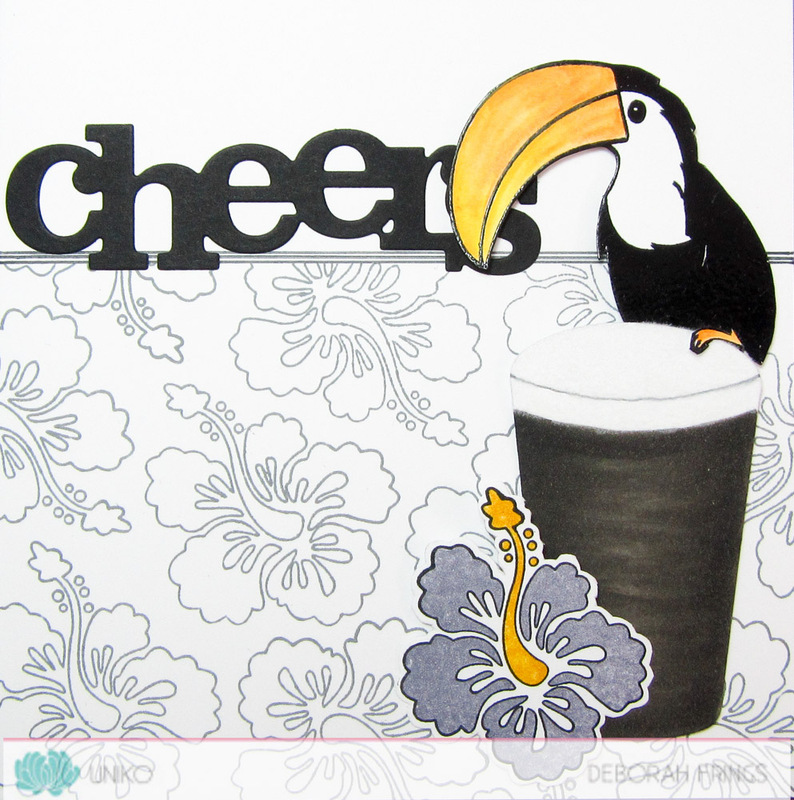 As soon as I saw this set I thought of the toucan adverts for Guinness that ran in the UK, and that's the theme of my card. I stamped the toucan in Versafine onyx black and heat embossed it with clear powder. I coloured the bill and feet with watercolour pencils, and then fussy cut the bird. I made the glass of Guinness from a coffee die. I coloured it with Copic markers and added white flock for the white froth on top of the pint of Guinness. I die cut the word "cheers" from black card - works so well with the pint. I finished the front by added a coloured hibiscus flower. I think this works as a masculine card. What do you think? 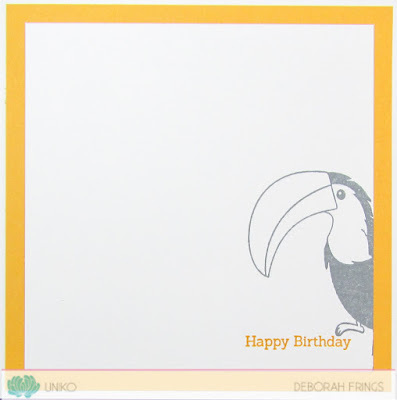 On the inside I cut a mat layer of yellow card and on the white panel added a birthday greeting and another toucan. Do visit Bev's blog to see more inspiration cards from the rest of the team. As an incentive to play along, we have prizes! The DT will choose a winner who will get a £15 gift voucher. The DT also choose a Top 3, who will each get 100 Loyalty Reward Points added to their Uniko customer account. We also do a random draw for all those who use a UNIKO stamp. 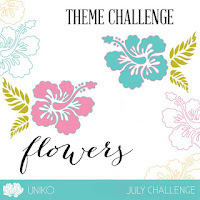 This winner will get 200 Loyalty Reward Points added to their UNIKO customer account. You've got plenty of time to play along with this month's challenge - the deadline for submission is midnight (BST) on Friday 12th August (that's 7.00pm EDT). Before I go below you'll see a couple of clips from U-Tube - they are toucan Guinness adverts; enjoy! These youngsters who don't remember the TV ad make me feel so old! Fabulous take on the ad bringing it right up to date with the addition of the hibiscus flowers, genius or should I say guineius. I love the inspiration for your card. And nothing says masculine quite like a hibiscus, a toucan, and a pint of Guinness! Thanks for playing along with us at Freshly Made Sketches! Oh this is just wonderful Deborah! Your toucan is fabulous perched on your card and the addition of the flower is perfect! thanks for joining us at FMS this week! What a fabulous card! Your clever stamping has made this a perfect masculine card! Brilliant inspiration and a FAB card.